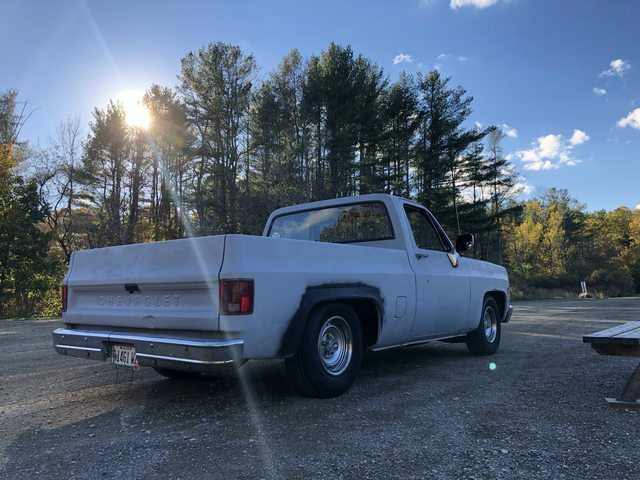 Initial body work phase involves a super budget at home paint job - this is only expected to be on the truck 2-3 years but here in Maine, even not being driven in the winter, it will rust if I leave it primer, so, I thought it might be fun to let the community help me pick a color for this "temporary" paint job. I've looked around at so many different color choices/options and searched high and low for photos, and thought it might be fun to get the community to post some of their favorite photos of trucks in the colors I have mostly narrowed it down to. My truck is a base (Custom Deluxe 10) with no trim, with the exception that I'll be putting the drip rails and trim back on. No fender trim, no race track trim, etc. So, if anyone wants to contribute, post up your favorite smooth side matte black, bright red, or white trucks. Don't like my choices? Here's what I have to pick from! I am not afraid to mix a color either. Last edited by skyphix; 11-14-2018 at 07:12 PM. For a super budget at home paint job go with white. White. It'll hide A LOT of imperfections, plus white always looks classy to me. Carp. Local 224. Buy made in the USA! If you plan on repainting it down the road don't use implement Enamel. It will have to be completely stripped off before you can use an auto type paint over it (if that is what you are planning). As for my choice in color... hmm...I like most of them! School bus yellow HELL YEAH! Ford Blue, Ford Red, Oliver Green. All nice. Thanks guys! White was my favorite - I'm not rejamming it either and that's red so I think it will be a pretty cool effect - red interior and white exterior - unt I take it back down to metal and strip the interior once the mechanical are sorted out. My plan is to take it back down to metal in a few years to more properly repair the body issues that I'm taking a first pass at fixing this winter. Otherwise I'd do it right the first time - gotta put my money into mechanical while I teach myself the finer art of body work. Yep...white would be my choice.. I think I saw your truck in another thread but can you post a pic of it here? Sometimes seeing the rig helps choose a color. You dont have to twist my arm! I'm not keeping the Rallye's - at least for this project - but I am budget hunting for the wheels I want one at a time on ebay until I get a full set (black D window or soft 8 style wheels, 17x9's, 275/60/17 rear and 245/65/17 front.) Its also going to come down about 2" in the front and up about an inch in the rear this winter as I rebuild the front suspension and go through the rear suspension to make sure everything is good there. Cool, thanks for the pics. Here's my take FWIW. Since it is going to be temporary, I think it would be cool to pick a brighter color than you typically would. A color that you don't mind in case it ends up being a little longer than temporary. Whichever red that most closely matches your jambs is a good, bright, "practical" choice. 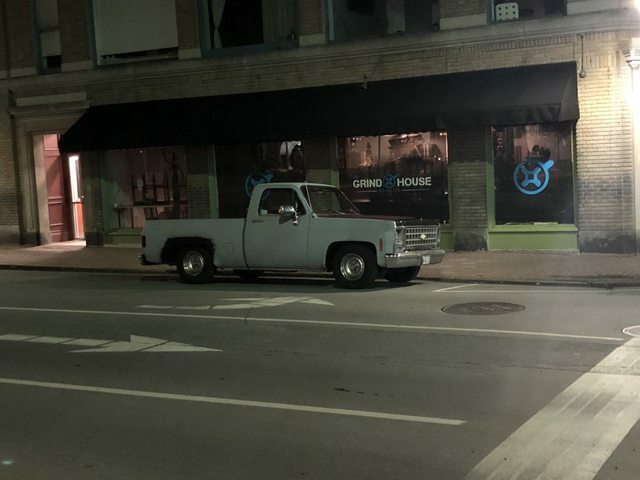 For me, I could see your truck in one of the two blues. Both blues look like a color Ford had on their trucks back then that is very similar to one that they put on the current Mustangs. I think it's called Competition Blue. GM had shades of blue on either side of it, usually with more green in them. I've always liked that blue. Since it's for fun, who cares if it's a F**d color? You know, I never noticed that the Ford tractor blue (I grew up with Ford tractors before we went to JD and eventually Case/IH) is really close to Competition blue, just less metallic/pearl. Good eye. I'll have to pick a can of it up and do a test spray on my spare hood and fender. Case/IH Red is almost an exact match for my door jams and interior roof. Thats what had me leaning that way even though I think I personally like a white truck more, but the more I look at photos the more torn I get! I see what you're saying with the go a little wild with it. Makes sense. Funny, now you've got me thinking out scenarios and it's not even my truck, haha! I hear you on the side panel and I think you would be able to mask and paint with no problem. At some point though, why do temporary if you are going to do all that detail? So, sticking with the temporary theme, I would minimize the amount of bodywork done at this stage, if any. And go ahead shoot it. I assume that the main goals are to protect what's there and get it all into one color? In my thinking, if I had a truck I was painting red, for some reason I would want it all nice and straight. With that blue, I think you can get away with painting over imperfections and it will still look cool. In fact, I would get some flattening agent, as long as it was compatible, and knock the sheen down on the blue to help "visually smooth out" imperfections. Or go over the top of it with a matte clear from Rustoleum if it's compatible. The problem with red in a matte finish is that it turns a little pinkish because of the way it takes the light. But there is no doubt in my mind that your truck would look killer in matte blue. Exactly - I haven't ever done body work so this is a learning experience. My truck has lived quite a hard life so its full of fairly sizable dents that I am teaching myself how to pull out with a stud welder and slide hammer and hammer and dolly set, plus it has some sketchy patches on the bed side (see the black spray paint) and some more on the bed rails. I want to be able to reinstall some drip rail and in order to do that I need to pull a dent, so while I was originally going to spray to protect, I'm going to actually have to pull a dent and if I'm going to buy a stud gun to pull one I might as well pull a bunch... you know how it goes. I definitely don't see it being arrow straight this time nor is that really my goal for now - matte paint was really promising for me for exactly the reason you're saying with the smoothing out the wrinkles effect. Supposedly automotive clears will go over the Majik Tractor paints from tractor supply so I could theoretically spray a matte clear over but I will have to see where my cost falls. The hardening agent that the implement paint calls for actually increases the shine unfortunately, but I may be able to find a low-budget way to dull the paint (maybe wet sanding but it seems like that would be hard to get even) - the Wimbledon White I do WILL have a Matte clear over it even if I do a single stage urethane because it fits the overall theme of the end product so well. 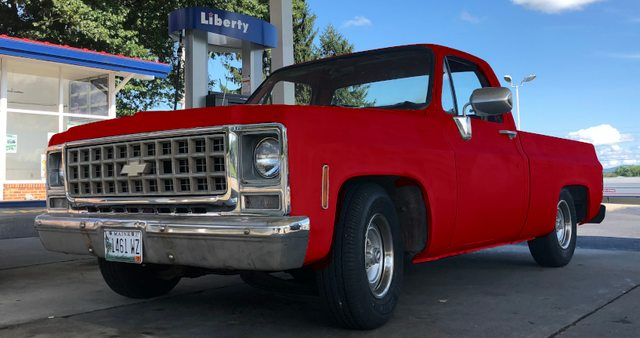 Someone posted a really sweet flat red truck in my build thread, I attached it here. It belongs to "2drpost"
White roof and rallies with the Orange body. White roof and just about any of the colors on that chart would look great! Are you able to Photoshop? That's an easy way to see it before you paint it. Love these ideas! Keep them coming. I did some solid color quick and dirty/rough photoshop mockups (I usually use PHotoshop for color correction/etc for photography... first time trying my hand at color changes) - these are all single color, I'll attempt a multiple color (white roof, etc) next. That red does look nice! What brand of implement paint are you considering? Valspar or Majic Tractor (Tractor Supply) is what I've been leaning toward because of the price - for under 60 in materials it will cover the truck. It has a super long dry time but I am ok with that since it will be just sitting in my garage with no engine/trans at that point. I would suggest doing a search on Majic - I did the same and found that Valspar seemed to be better. Also, try using an AUTO enamel reducer (I used NANOSKIN bought on Amazon) from the auto supply and Valspar Hardener. Gives a much better result and reduces dry time. Excellent advice! I heard the same about Valspar, and that it doesnt take weeks of time for it to dry. Good idea on the auto reducer - I was just going to use Naptha but I know that can be a slow drying thinner as well. The Valspar hardener should make it a bit more glossy too. Using white (real auto or truck) a fleet shop may sell some cheap. Using that white could act as a base for another color (red/blue/orange/ect) and intensify the top coat someday as well. Thats a good point. I also found this site, which is getting good reviews, and the single stage urethane gallon kits are maybe $20 more than the implement paint setup with the hardener and thinner. So, back to the drawing board on the paint itself. I have some of the implement paint already so I can test out a couple of colors, so I'm going to see how well it lays out and if I like the way it sprays. The weather is cold here, and even though I have a good sized propane heater (made to heat 1500 sq ft and my garage is no where near that) and am in the process now of insulating the garage now, I know different paints and finishes will lay down differently at the extremes (low humidity, etc) - so I'll test and see what I like best. 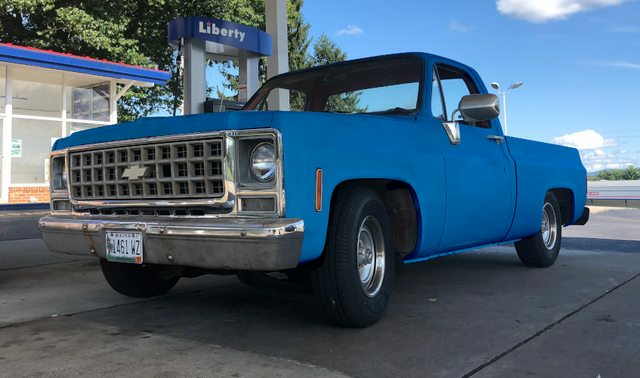 We have a 1973 F-100 that is blue with a white roof. The order sheet describes it as Bahama Blue and Wimbledon White. That blue looks the same as a 1980's Ford TW-25. It is an awesome color. For 4x4 81-87 longbeds, I think the charcoal/gray two-tone is the epitome. I wouldn't mind seeing a similar paint job based on a chocolate brown, too. Picture is not mine. I just pulled it off the internet. I've checked them out too and heard good things about their products! Thats where I plan on getting the Wimbledon White from for the final paint job. 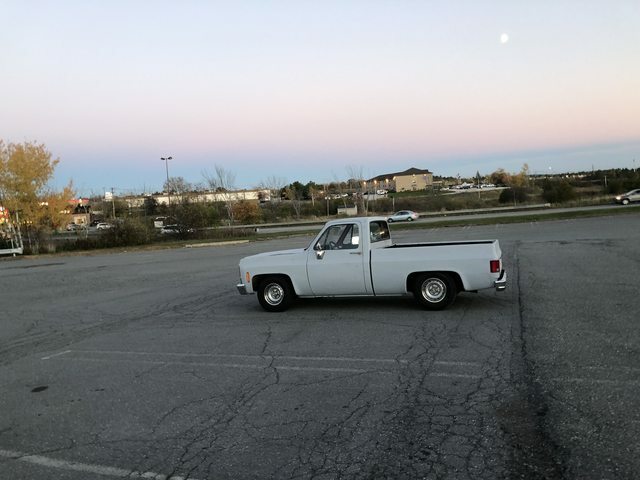 I like the two tone gray on the mid 80's trucks too. I also like the red/gray two tone. I really love the two tone brown and two tone tan on the 73-80's. 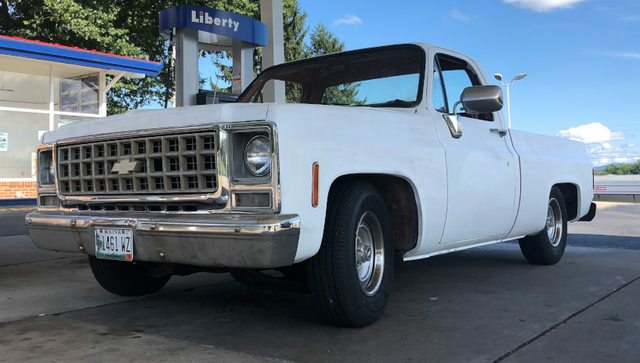 With my C10 being such a base model, without any trim to speak of or even the holes drilled, I'll either do white roof or solid color. 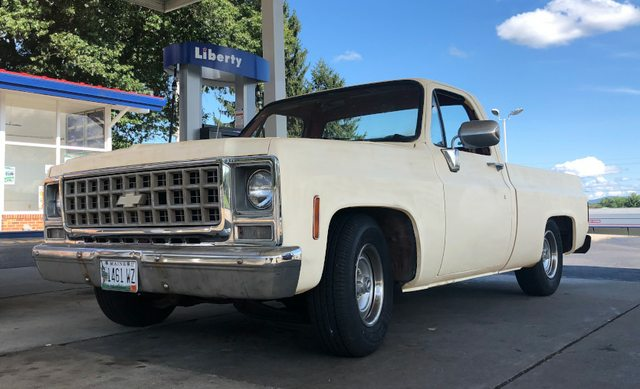 That said, I am already keeping my eyes open for my next project - a 4wd Suburban, preferably 73-80 but whatever I find that is solid and what I am looking for, and that WILL be two tone. Thats a few years away before I am purchase ready though.